Lots of gear from "GrandPa's Lot"
Re: Lots of gear from "GrandPa's Lot"
What do we think this guy is worth? I would say "free" to any collector that has a similar unit in their TEA stash already, just pay shipping. Its too nice to keep as a decor piece, and truth be told, I wil never use it for anything other than fun/learning. Ahem, thanks for pointing out it's great cost, as always it's the prices they're actually selling for, not what they're listed at that's important. I just bought a fully working 66311B for £100, but ago keysight tell me it's worth thousands . As I don't really need it, just wanted to add it to the standards, I'm happy to see it sold to fund inverted's TEA or given to someone who can make a better case for it! so maybe this is the other half, its quite large though. (i think its another self contained WSB). I believe the temperature calibration standards still require the use of a bridge, at least that's according to a researcher I know who helped redefine the Boltzmann constant a decade or so ago. I told him I had a DMM7510 and he was very excited but was sort-of disappointed with its resistance range (! ), as temperature work requires more precision. You've got to have some grounds for getting a partial refund or a fresh cal from the supplier? Is it ok to sell out of cal meters? Great idea, I love a happy ending! NO ONE LIKE COOKIES HERE? Is that including or plus shippinig? As promised, with much more to come. Enjoy and Prost! Please add the item description so it's not necessary to go to eBay to find out what it is. its actually one word there guy "nitpick". if you are going to correct someone, get your ducks in a row first. It wasn't a correction, it was a joke. 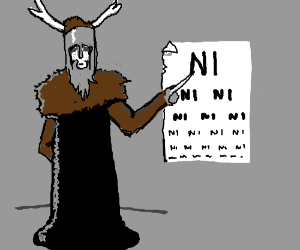 We are no longer the Knights who say NIT. We are the Knights who say ickyickypekangwhoopboing.